Williams Brothers Stores was a grocery and provisions shop situated towards the south end of Hoddesdon High Street. My parents met while working there. I can remember going into the store when I was quite young. I believe it closed down in the late 1960s. Next to it was Woolworths on one side and the Golden Lion Public House on the other. Woolworths sold plastic farm animals individually and I remember collecting them, one each week. Further down and across the road I can remember Stones, the first record shop in Hoddesdon. It was originally just an electrical and radio shop. There was a definitely a Williams Brothers in Ealing W13. My last memory of it was around 1962. It was at the far end of Northfields Avenue on the right hand side. They used to give green shield stamps that my Mum used to collect. My Grandad Rupert Simper use to work in the Williams Brothers store in Hayes Middx.He lived in Brookside Road. I started work in Aug 1961 as a butchers boy at 5 Farnam Rd Harold Hill Romford ESSEX. I owe my whole butchering career to William Brothers .I butchered for 40yrs thanks to them sending me to Smithfield college day release for 4years.These were the days just after rationing and the people in the trade were very skilled but willing to teach us youngsters.William Brothers had a staff bonus scheme sharing profits just before Christmas.Happy carefree days. There was a Williams Brothers in Streatfield Road Kenton/Queensbury that I used to frequent when I was young, 50s/60s. Was there a Williams Brothers in Northfields Ave, West Ealing W.13 ? Does anyone have pictures of the old divi “coins” that Williams Brothers issued. Use to go with my mum to the branch in Ballards Lane (?) Finchley and remember counting them all out for the divi days. I remember Bryan Nunn very well. Actor Graham Stark bought his home in Whetsone and that was when Bryan and his long time friend Lily moved to Norfolk Island .They eventually returned and lived in Slough area.l stayed with them the night before l was leaving on a trip to Australia. I was General Manager of Reddings Tea part of Williams Bros. My office was in White Hart Lane. After the Booker takeover in 1971 I became Sales Director but 1972 they sold Reddings to Crown Foods in Liverpool. I moved into the Cash & Carry side of the business. I left in 1979 and later became MD of AF Blakemore & Son Ltd in the Midlands. The largest SPAR wholesaler in the UK. I have been retired almost 17 years now but try to keep in touch. Hi all, I believe my late grandmother worked at Williams Bros and I’m trying to check that this is the same one! Her name was Audrey May Nash, Neé Brown, and I have a 21st birthday card from a Dorothy and F.W Williams, dated 1949. Any ideas very welcome! Thanks. Win and Sid Marsh, my Grandparents were caretakers at Holloway Road Branch until 1957. I remember Alan French and his mother, Auntie Rosie visiting them at Combe Martin in the sixties. I am 91 and live in Dublin. I was Head Office Manager from 1953 until 1971 when the Company was taken over by Booker and traded as Budgen. My father worked for the company for many years up until 1948, I worked for the company starting at the Tally Ho corner branch in 1960 then moving around various branches in London finishing at cockfosters, keep the ‘divi’ .Happy days. Its Paul Williams.Glad to see a following.Paul and my brother John still hoing strong. I look forward ti any corespondence. I worked at Williams Brothers DSS head office in White Hart Lane as secretary to the Company Secretary, Stan Sainsbury. Bryan Nunn was there during my employment as well as Paul Williams and John Williams (sons of the Managing Director). I also remember Brian Nunn, he was great with boys clubs and junior football had a lot of time for all. I am first cousin to Bryan Nunn. I have just returned from Norfolk Island and found many references to him there, including people who knew him. He and Kenneth Nunn were proprietors of Williams Bros. Paul may have been one of the nephews. Kenneth had daughters, and Bryan never married or had children. Bryan went to Norfolk Island after the business sold in 1971. Stayed there until 1986; was elected onto the Council and then the Legislative Assembly. More info if you email me. Hell, I am trying to trace the history of Brian Nunn who was one of the directors of Williams brothers. Please can you help in any way? I was one of the boys at friern Barnet Boys club, he took myself and a friend to his boat on the river. I have a feeling it was the thames,however,I was a little young to be sure.I am 70 this Christmas coming with time on my hands. Thank you for reading this and I do hope you can help. Please contact me via Herts Memories. I am pleasantly surprised by this article. Firstly, it may explain why the Dave Clark Five were associated with Tottenham. Secondly, I was curious as to the size of this company. My late mother had a cousin; who married a man; who I believe was the caretaker at Williams Bros. in Holloway Road in The London Borough of Islington. His house; was in; I think, Benwell Road. It backed on to Williams Bros.. Thanks to this article, I did not realise there were any branches in Hertfordshire. I also remember that we had a Stones in Hemel Hempstead. I do not know if it was the same company as mentioned. But I believe our one may have got absorbed into the Dixons/Currys set up. Dave Clark (of Dave Clark Five fame) used to live in a flat above the Phillip Lane, Tottenham branch of Williams Brothers – not a lot of people know that! 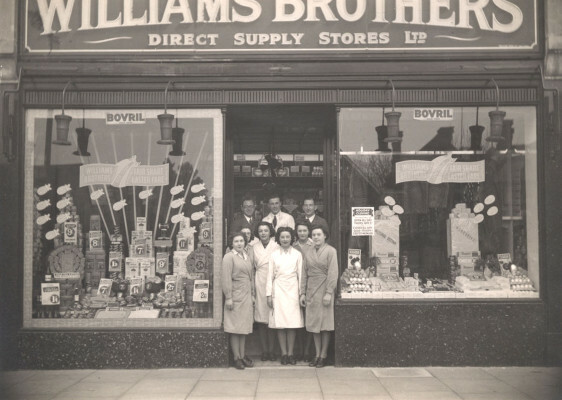 My mum worked at Williams Brothers in Potters Bar High Street. I used to work for the MD of Williams Brothers, around 1969, when their Head Office was located in White Hart Lane, Tottenham. I think I’m right in saying that there were two ‘young’ Williamses working there at the same time – Mr Paul? is the only one I can remember. The MD was Brian Nunn, and he left at about the same time as I did, I think, but he went off to Norfolk Island: I went to Hertford! I never remember much work being done in my office concerning the company’s retailing, but more to do with the boys’ clubs Nunn supported. Hi, do you have any idea how I would go about finding out which Williams Brothers ran these stores? Editor’s note: This link has been removed as it does not now work. Steven can you supply an alternative link?